See What I Wanna See has quite the pedigree. From composer Michael John LaChiusa (best known for his Tony Award winning Broadway hits The Wild Party, Marie Christine and Chronicle of a Death Foretold), the show premiered at New York’s Public Theatre in 2005 and starred Idinza Menzel in her first role since creating the part of Elphaba in Wicked. This production marks its European premiere. It’s a musical all about perspective, about points of view, about how our experiences affect how we see things. LaChiusa has paralleled three different stories from Japanese writer Ryu Akutagawa. Together, there are thematic links on the nature of truth that pose some intriguing questions. Individually, though, they’re flawed. The first story is a tale about two lovers set in Feudal Japan that’s deliciously sensual, establishing an almost dreamlike and provocative mood – it’s immediately apparent this is no jazz hands musical. However, it’s used merely as a framing device to open each act, so is too slight to make a further impression. The second is set in 1950s New York and plays out like a noir thriller as we hear different testimonies in a murder case. It’s perhaps an obvious set-up to explore perspective and it relies on clichéd noir tropes – the jazz singing femme fatale, the sleazy nightclub, the dodgy dealings of shady male characters. It’s little more than a murder mystery that structurally is overlong and becomes tedious re-treading the same story on repeat. The final tale, set in post-9/11 New York, is an exploration of religion – perhaps the ultimate form of perspective and a very literal interpretation of the show’s title. Here, a priest who has lost faith sets up a hoax miracle in New York’s Central Park, playing on the gullible nature of humanity and the mass hysteria that faith can cause. In miracles, we really do see what we want to see. Thematically, this is the most loaded of the stories but it feels too shallow and relies on stock characters – it surely deserves a more thorough study in a standalone piece. Above all, though, there’s one perspective that is ignored: that of the audience. See What I Wanna See lacks ambiguity in its storytelling, robbing the show of a potential extra dimension by inviting the audience in so that we too can see what we want to see. Instead, we merely watch a multi-stranded story play out before us. Musically, too, the show does little to draw us in. There are some moments of sumptuous vocal harmonies and some beautifully soaring melodies. Yet for the most part this is an abstract and experimental score that merges styles from the different periods – jazz and orientalism especially – but any musical links between the three narrative strands are too subtle. It lacks the fiery tunes that made, say, The Wild Party so popular. Sure, this is a different type of musical: it’s striving for Sondheim but doesn’t quite make it. Director Adam Lenson’s production is sadly a slave to the limitations of the venue. Using simple staging may have been intentional to allow the narrative complexities to take the fore, but it feels stilted and static. The lighting, too, is simplistic, with down lighting often leaving the cast in shadow – again this could be intentional to evoke mystery, but it doesn’t have the stylish mood required. 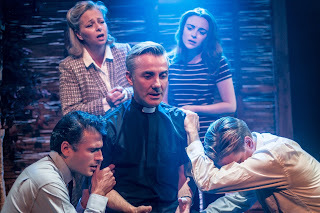 The ensemble is excellent throughout, but two performances stand out: Cassie Compton’s powerful vocal cuts across the band without amplification, able to soulfully and lithely interpret some difficult melodic material; and Sarah Ingram delivers a performance of both comedy and truth in a variety of roles. 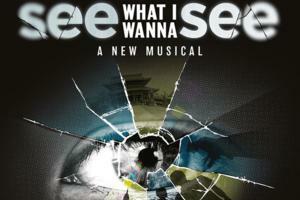 See What I Wanna See is certainly an interesting piece of theatre, attempting to tackle a complex subject in both form and content. It’s just not as clever as it could be. 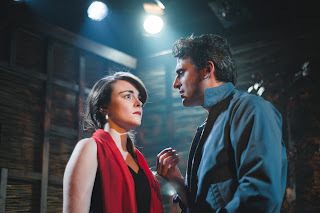 Watch: See What I Wanna See runs at the Jermyn Street Theatre until 3rd October.